2 king beds and 2 twin beds Spectacular Views! Community Pool! 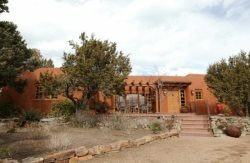 This elegant 3BR home with three private patios, located in the exclusive Bishop's Lodge Villas, offers stunning unobstructed views of the Jemez Mountains. Hike at one of the gorgeous, nearby state parks including the Bicentennial/Alto Park or the Hyde Memorial State Park or go horseback riding at Bishop’s Lodge, which is a 10-minute walk away. After a fun-filled day, kick back in the community pool before enjoying a movie in front of the fireplace in the spacious living room. The beautiful living room features high wood-beam ceilings and floor-to-ceiling windows. Fashionably decorated with interesting and original art and comfy furniture from Restoration Hardware, the spacious living room acts as the social heart of the home. Enjoy the warm ambiance of the wood-burning fireplace while you watch a film on the 42” flat screen TV with a DVD player, sound system, and premium cable. The chef in your party will appreciate the modern kitchen with all stainless steel appliances, ample granite counters, a double sink, and a gas range. Perch at the kitchen bar for snacks with seating for two. When it’s time to feast, enjoy dinner for six at the dining room table. The master bedroom includes a king bed, flat screen TV, wood-burning kiva fireplace, a private patio, and an en-suite bathroom with a double vanity, large jetted tub, and a walk-in shower. Two additional bedrooms are located across the home. The first provides a king bed, wood-burning kiva fireplace, flat screen TV, a private patio, and an en-suite bathroom with a shower/tub combination, while the second includes two twin beds, wood-burning kiva fireplace, a private patio, and an en-suite bathroom with a shower/tub combination. Enjoy dinner al fresco on the large flagstone patio where you can enjoy the expansive views of the mountains and sunsets at the table that seats six. Each bedroom includes a private patio and courtyard for a sun-kissed morning coffee or an intimate dinner for two. This lovely villa is adjacent to 200 acres of National Forest with excellent hiking trails and epic panoramas. Take a 12-minute drive to enjoy a shopping excursion at Sena Plaza or the Plaza Galleria. Once you’ve worked up an appetite, visit long-standing local favorite Izanami Restaurant for upscale Japanese bar bites, artisanal sake, and craft beer. Bishops Lodge Villa 43E is not managed by the Bishops Lodge Resort and does not include resort services!